“Remembering” was terribly important to the Jews. The LORD repeatedly told them to set up altars, memorial stones, and even feasts of the year in order that they should remember the events that transpired there. The Christian church has picked up that element of the faith and carried it forward into the New Covenant. We not only recall the incredible events in the life of Our Lord Jesus Christ, but also the people who came alongside Our Lord and carried on His will after He ascended into Heaven. The calendar of the Church year is chock full of these commemorations which we call feasts. All of the Biblical Saints have a feast. Some of them have more than one. There are a few occasions, however, when some lesser accomplished saints find themselves sharing a day with two or three of their companions. The first of May is one such day. “Where shall we buy bread, that these may eat?” But this He said to test him, for He Himself knew what He would do. St.James receives even less treatment. 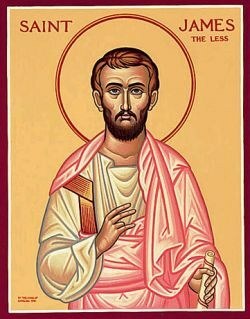 This is, after all, the bearer of that name whom Holy Scripture and history have recorded as “James the Less.” (St.Mark 15:40) This is not the James who was the son of Zebedee and brother of St. John, who along with his brother and St.Peter made up Our Lord’s “inner circle” of Apostles. Nor it this James the brother of Jesus who became the first bishop of Jerusalem, presided over the Council of Jerusalem (Acts 15), and, because of his faithfulness and devotion in that city, was known as James the Just by both Jews and Christians alike. It is not even the James who wrote the epistle which bears his name. 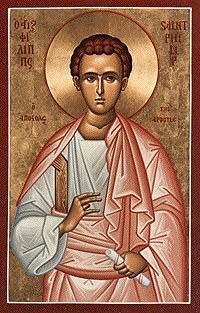 In fact, we do not know anything that St. James the Less actually said or did. So, what can we say about these two men? What do we know about them that is worth celebrating? We know with whom they were associated. Our Lord chose them as two of His twelve closest disciples. We know they were with Him from early on in His ministry and still gathered together when they believed that He was dead. 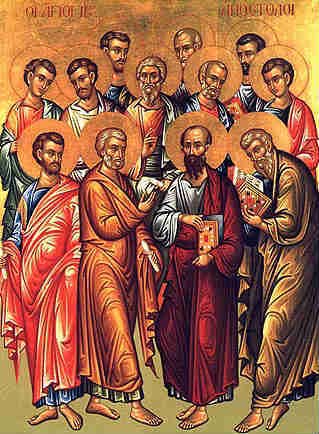 We know that they were Apostles, hand-picked by Jesus Christ to carry His message to the ends of the world. Maybe that is a lesson in and of itself. Perhaps it is the opposite of the old “if you sleep with the dog, you wake up with the fleas” adage. We know nothing with certainty about these two other than they were “with Jesus.” Now, we may never know what it like to be at the Wedding at Cana, the Sermon on the Mount, or the Last Supper, and we may never find ourselves laying around a campfire looking up at the Judean night sky with Jesus laying nearby, but we may have something the Apostles lacked when they were doing those things. We have the Holy Spirit inside of us; we have Jesus Christ in our hearts. Like Saints Philip and James, we have the opportunity to be “with Jesus,” and that may be the only thing we need to have written about us in the only book where it really matters, the Lamb’s Book of Life.